Hey Guys, Recently another developer shared another Oreo ROM for ASUS Zenfone 5 and Zenfone 6. At this time this Oreo Update is not stable and alpha version of Android Oreo 8.0 from xda developer tank. This builds create on latest Google Android 8.0.x source code with Linux 3.10.x kernel. Below you can read working features and bug's. This Oreo Update ROM tested with Zenfone 5 T00J/T00F but do it with your own risk and I am not responsible for any damage. If you think there is a bug in this ROM. Before Installing the Custom ROM on your device. You have to flash custom recovery TWRP Touch Recovery on your Zenfone. If you are already using Custom Recovery Go to next flash step otherwise, please use this tutorial to flash TWRP Recovery on your Zenfone 5. First, You have to download Oreo ROM files link given in end of the post. After Download, Extract ADB Tool and system.zip on your desktop. After Extract, Copy system.img, boot.img in extracted ADB Tool Folder. Reboot into bootloader mode by using the Power + Volume up button. Connect your Zenfone with PC using Data Cable. 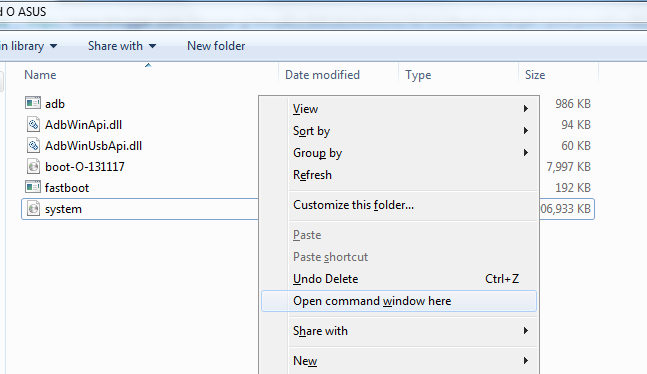 In command window enter the following commands one by one. Restart the device and enjoy Oreo on your Zenfone 5. Congratulation, Now you can enjoy the Android Oreo on your Zenfone 5. First boot can take up to 5 - 10 Minutes. So, Please do not power off your device in this stage. Once the boot complete it will ask for WiFi or mobile data connection, Google Account etc. Fill all information if you want to access Play Store/ or Gmail Applications on your device. Before you go, You can also check out Lollipop Marshmallow Nougat Custom ROM's List for Zenfone 5. Please share this post and your reviews/ or bug report with our other visitors.